Prices vary widely when booking a Rhine River riverboat cruise holiday. Cheap deals often indicate that fewer options are included but saving are possible especially for early reservations. Prices often vary widely on riverboat cruises on the Rhine River and tributaries such as the Moselle, Main, and Danube. Cheaper prices are available for early reservation but different levels of luxury and the inclusion of on-shore excursions can also greatly influence the price. 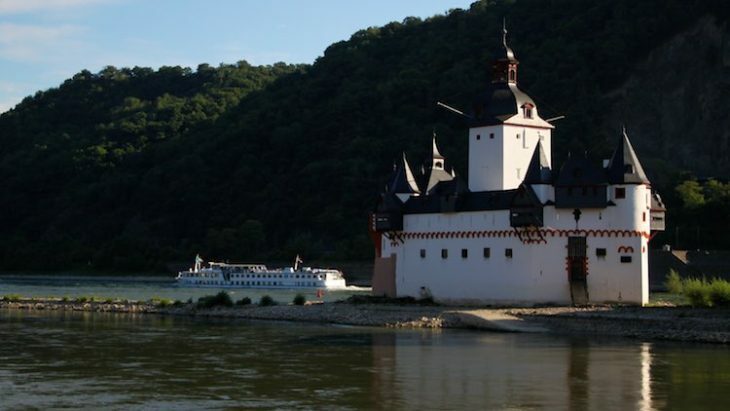 Rhine River cruises often book out early with last-minute reservations and late-booking discounts almost unheard of for the all-inclusive luxury cruises mainly sold on the international market. Discounts are available for early reservations where “early” for some lines can be more than a year in advance. Surcharges for fuel, security, tax, and special foods have not really taken off with European riverboat cruises. Cruise prices are generally all-inclusive but it is important to read the fine print to confirm what is included as well as the terms and timing of final payments. Especially where exchange rates are involved it is important to note at what stage the final price is really final. Luxury riverboat cruise liners, especially those that market heavily in the American and other non-European markets, often include much more excursions and meals than cruises aimed at European travelers. Europeans often prefer to arrange their own shore excursions and to take lunch away from the boat. The more up-market riverboat cruise lines usually include more onshore excursion when selling cruises in international markets. This is in part to allow non-European cruisers to include as much as possible of the cost of the vacation upfront and not to be bothered by exchange rate variations while on holiday. Luxury riverboats often have all three meals on board – read the fine print concerning drinks – wine and soft drinks are often included with dinner (sometimes per glass, often without limits). Internationally markets cruises often include several, or even all, shore excursions without further surcharge. Given the high cost, even when heavily discounted, of a European cruise vacation, adequate travel and cancellation insurance is a good idea. Cruise fares are often due and non-refundable months before the cruise departure date. Dreamlines is the largest German cruise line agent and handy to see what is marketed to German customers. However, bear in mind that even the same boats may offer different levels of service, and operating language, depending on what market the specific cruise was offered in. Children are not that often seen on European riverboat cruises. Cabins usually are too small to accommodate more than two persons and often an additional cabin will have to be booked at the full adult rate. Childcare facilities and entertainment aimed at children are very rare to completely absent on most boats. However, discounts are sometimes available for children and some boats can accommodate a child in the standard cabins. Many internet reservation services do not list child discounts and cannot book them. It is therefore important to compare various reservation services to see if child discounts are available at all. Regular travel agents can usually book child discounts or contact the cruise lines directly – the savings when available are more than worth the effort. Single passengers usually have to pay a high surcharge – 150% for cheaper category cabins and as much as 200% for suites are quite common. Once again it is worth comparing to see what discounts are available – some cruise lines have specials for solo travelers on some less popular cruises dates. Many European riverboat cruise lines give special discounts to persons and couples celebrating special birthday or wedding anniversaries. The anniversary should usually be a round number or special number such as 25 – conditions vary but it is worth comparing what different lines have available. The anniversary generally has to be in the same calendar year as the one in which the riverboat cruise is taken. Online reservation services often do not list and cannot book these discounts. A travel agent specialising in riverboat cruises can be invaluable in finding such special deals. Cruise Only or Cruise & Air for European Riverboat Vacations? European riverboat cruises are generally priced as “cruise only” or “cruise & air”. It is worth using online reservation services to see what airfares are available prior to making a final decision. If booking “cruise & air”, good deals are often available for upgrades to business class. However, coach fares are often cheaper when booked separately, especially if cheap deals are available for out-of-season travel. “Cruise and Air” fares usually include ground transfers from the airport to the port of departure. It is generally easy to catch up with a European riverboat cruise but even if missing the departure is not the same disaster as missing an ocean liner, it may be worth arriving a day early. Transfer services are often best booked in advance – it is worth comparing prices as rates vary widely. Various routings are available for cruises on the Rhine River that may include some major tributaries such as the Moselle and Main rivers. See also General Tips as well as Top Riverboat Cruise Lines for more information on booking the ideal Rhine River boat cruise vacation.